The Mercedes C63 AMG Black series is the most focussed car that Mercedes Benz make. In the metal it looks spectacular. The white bodywork of the car I drove perfectly augmented the black wings, flips, wheels and trim. For a car with so many external protrusions it looks pretty. 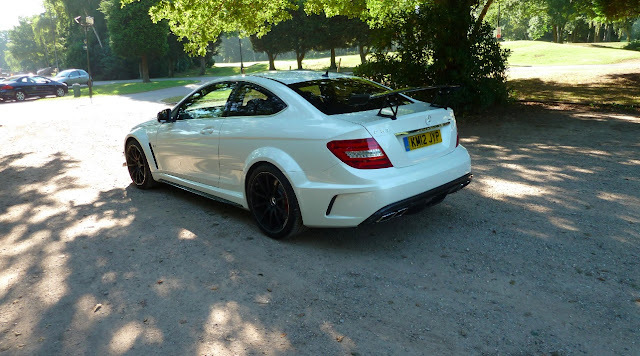 The lines of the standard car are a good starting point but with the flared arches, winglets, carbon rear spoiler, bodykit and those wheels it really does stand out from the crowd. Inside, the black theme continues. Black bucket seats, black dash - although with all the usual Mercedes niceties - but red seatbelts. Place the electronic key in the ignition and fire up the 6.2 litre, 510bhp V8 and you are initially met with a brief blip of thunder before it settles into a deep rumble. The C63 AMG Black is an easy car to drive at low speeds. Visibility is good and the normally aspirated engine behaves. Urban streets, traffic jams and speed humps present no problems at all. But whilst you are behind the wheel of the car a devil sits on your shoulder. A naughty, belligerent devil. Whilst you are sitting in the traffic jam you know what it can do. 0-60 in 4.2 seconds - and it'll make the most heavenly sound doing it. You can't dip the clutch and rev the engine because there isn't one - it's an automatic. A seven speed, flappy paddle automatic that switches seamlessly between gears, but an automatic all the same. So you find yourself holding back in the traffic - making a space - and then flooring the throttle for a second to hear the mighty roar and feel the push in your back. 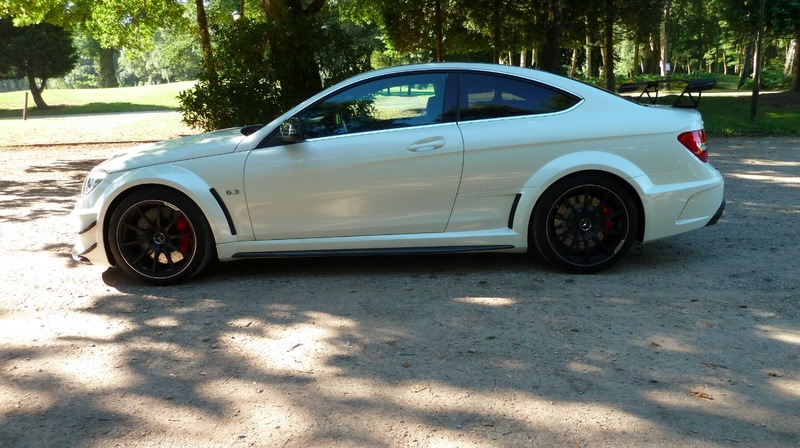 And then, when you reach the open road, the C63 AMG Black series basically turns into a race car. Precise steering, instant throttle response, brakes that stop in an instant and never fade. But a race car without a harsh ride and banging and rattling as you feel every bump in the road with your spine. This is a race car that smooths out the imperfections and cossets your ego. You can play with different settings for suspension, gearbox and throttle response but after a while you realise there really is no need. Just leave it as standard - maybe use the manual gears (lovely aluminium affairs perfectly placed behind the wheel) and have a blast. The AMG button and all it entails is only really any use on the track. 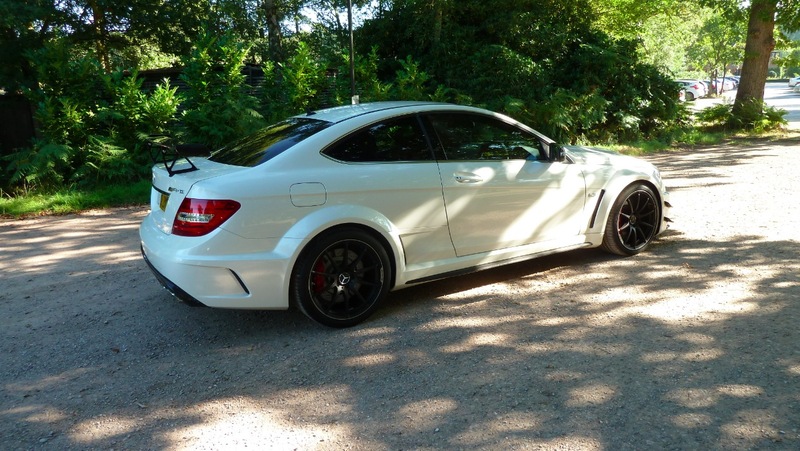 The C63 AMG Black series will handle anything you throw at it. Despite it's relatively portly 1700kg and the massive V8 lump at the front it refuses to understeer. But it will oversteer. Not that I was able to try that out too much. A lairy, oversteering Black is too wide for the road. Small hints of power oversteer on slip roads and roundabouts were enough to show that taking the car to the edge would be pretty easy, predictable and fun. UK speed limits make a mockery of cars like this. 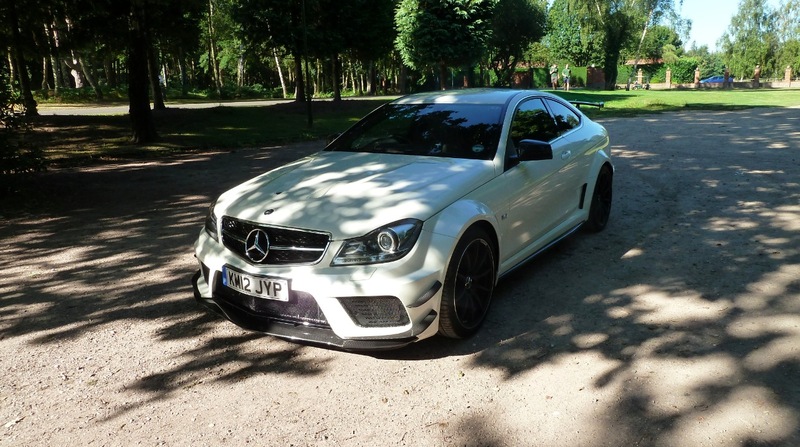 But with it's sheer ability to drive at any speed it makes for a magnificent all rounder. It really is a special vehicle - I parked up at a golf club to take some photographs. Within a minute I was joined by five groundskeepers asking questions and taking photos of the car. Sadly, I had to explain that it wasn't mine. I drove the Jaguar XKR-S and supercharged Range Rover Sport last week. Both screamed of wealth and opulence. Fantastic cars though they were I was always aware that the car was asking people to look at it and it this made me feel slightly uncomfortable. In the Mercedes you just feel as though you are in one of the most perfect driver's car ever made - and the fact it attracts attention is incidental.